You don’t need to travel 15 hours by plane to find authentic Asian flavors. Instead, head to Windsor. It is no coincidence that when the Thai boys’ soccer team seemed hopelessly trapped in the caves last summer, neighbors offered support to the muddy rescuers by setting up a makeshift kitchen and handing out food. Indeed, in much of Asia, locally sourced, freshly made meals are an intimate means of communication, and a valued currency. I know. I’m half Thai and a devoted eater. When I visit my mother’s relatives in Bangkok, the heart of Thailand, the first order of business is picking out what we are going to eat. A line-up of multi-hued dishes from the best street carts in the neighborhood are set out on polished teak tables—and only then can our visit officially begin. 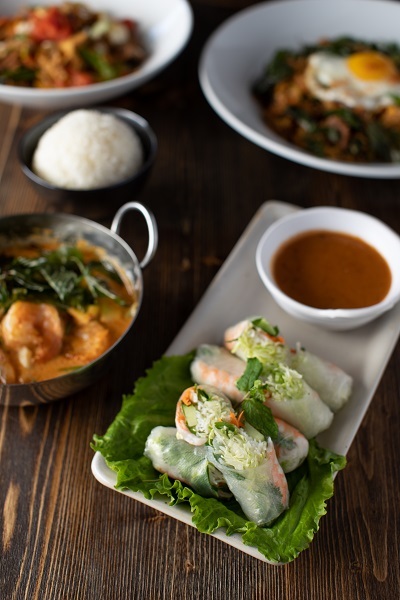 In Sonoma County, you can enjoy an authentic taste of this food-centric Asian culture within a small area near the Windsor Town Green. 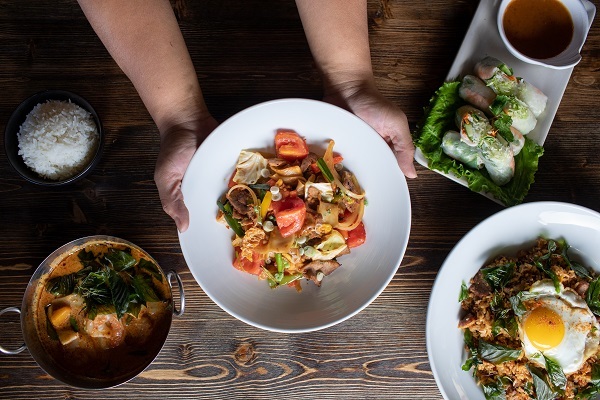 Some of the best Thai meals in the county are at Tomi Thai, just a few steps from spicy Nepalese curries at the Himalayan Restaurant. Walk another three blocks to enjoy made-to-order Hawaiian-Japanese poké at Oliver’s Market. Follow that with a jaunt underneath Highway 101 for sushi and soup noodles at Umé Japanese Bistro. Standards of preparation are exceedingly high at all of these eating establishments, yet none takes itself too seriously, and prices are very fair. 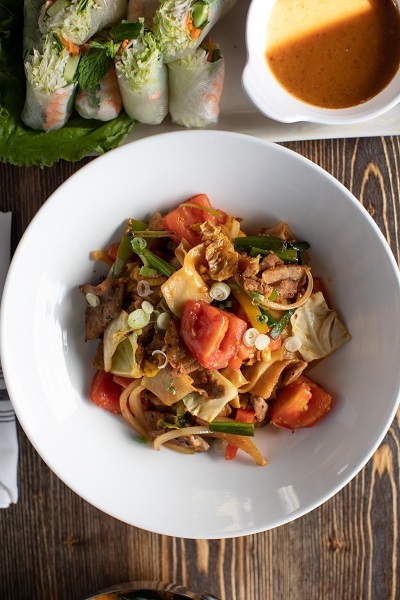 With such authentic menu items, it’s no surprise that visiting the center of Windsor inevitably reminds me of trips spent eating my way around Asia! Hungry yet? Let’s start our tour . 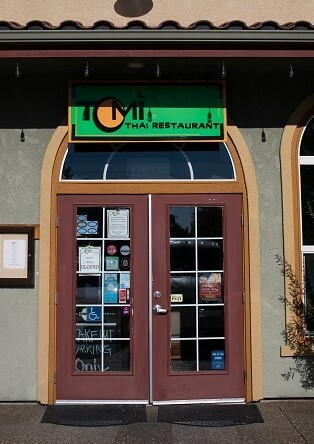 . .
We begin at Tomi Thai, which does Thai the way I’m used to, with a delicate balance of flavors and perfectly cooked vegetables. Tucked off of Windsor Road behind Baskin-Robbins, Tomi is a small and sleek place, punctuated by the personal touches to be expected at a family-run business. Tom and Mimi Khamvongsa opened the restaurant about 10 years ago and operate it with their adult children Kevin Khamvongsa and Diana Thomawong. An auntie, Jai Hart, also waits tables and other family members help out as needed. Like my mother, Mimi is from Bangkok, and she brought her grandmother’s classic recipes to the restaurant. 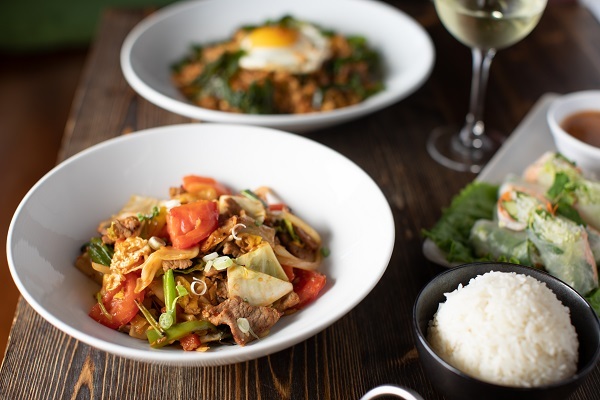 Tom is from Laos (the two met and married in California) so Tomi’s dishes have a hint of Laotian depth. I’m hooked on their green curry with chicken, made with basil, vegetables and krachai rhizomes, a root with a gingery, citrus flavor. A new favorite is Pad Kra Pow, stir-fried Thai bird chili, garlic, onions, Thai basil and ground pork. 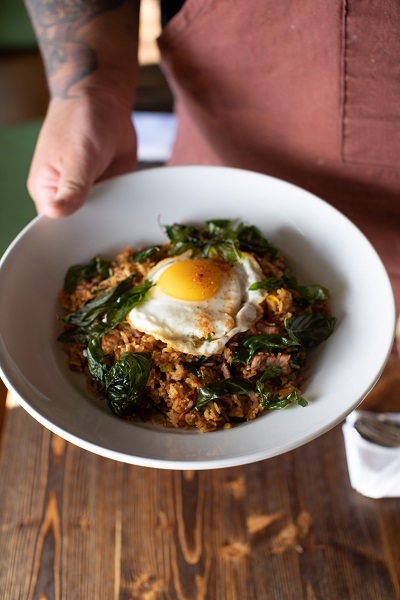 For some adventure, Kevin suggests Nahm Tok Moo, an appetizer made with grilled pork, chili-lime dressing, rice powder, abundant herbs and red onions, served lukewarm. Prices for lunch are about $11 and dinner runs from $11 to $20, with curries priced at $13. 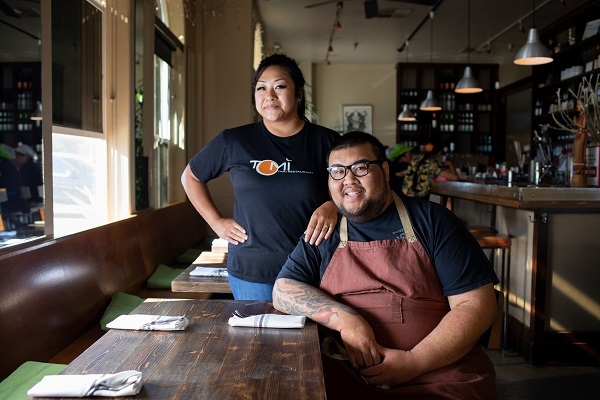 The restaurant sources most of its vegetables from family-owned Imwalle Gardens in Santa Rosa. Every few months, Tomi hosts 30-person winemaker dinners featuring Asianinfluenced dishes. For the October dinner, they paired dishes with beer from Seismic Brewing in Santa Rosa and wine from Stonestreet Estate Vineyards in Healdsburg. “We look for local food, wine and beer providers that are family-run like us,“ Diana says. Windsor has always been welcoming to the Khamvongsa family, Kevin adds. Kathmandu, Nepal sits in a valley of brilliant colors, and apple trees. 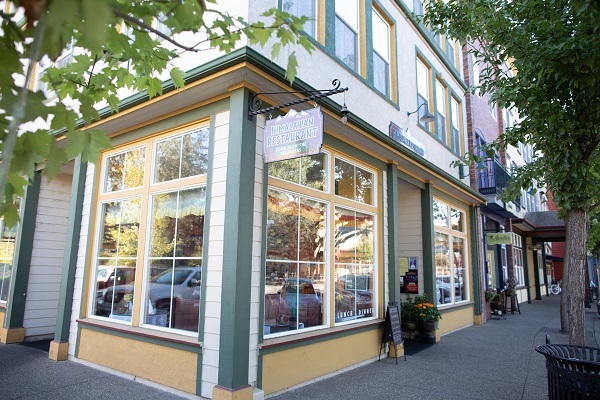 During my trip there several years ago I became a fan of the rich, aromatic curries, which are exactly what you’ll find at the Himalayan Restaurant, facing the Windsor Town Green. For the uninitiated, Nepalese food is related to Indian, with many of the same spices, while being less intense and heavy. At the Himalayan, for instance, olive oil is used rather than ghee, the Indian clarified butter. Bishnu Pandey cooked in top-ranked hotels in Nepal and Dubai before buying the restaurant four years ago. He redesigned it in lush orange and yellows, with tapestries scattered throughout and drawings of mythical figures on the tabletops. Outside is a pleasant patio. The dining area and wondrous smells make me feel like I’ve dropped into a fantasy land of Indian and Chinese cultures. 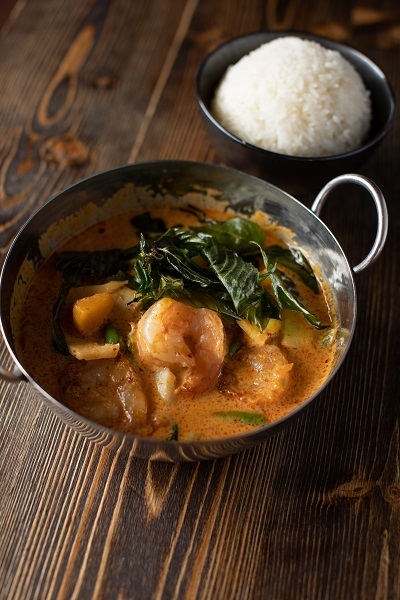 Curries, made with coconut sauce, tomato-based sauce or cream sauce, dominate the menu. For the main ingredient, you can pick lamb, chicken, seafood, tofu, okra, cauliflower, spinach or cheese cubes. My favorite is the fish tarkari— salmon cubes cooked in a coconut sauce with fenugreek, a sweet, nutty herb. With the addition of rice and naan, it’s a big enough meal for two. Curries run between $13 and $18. Want to try a typical meal you might find in a Nepalese home? Pandey points to the steamed chicken dumplings or momos, paired with a mildly spiced Himalayan noodle soup. For the more intrepid eater, try the Himalayan Goat Curry made with bone-in goat and Himalayan spices in the Nepalese style. Entrée prices are $12 to $24. Pandey clearly has a handle of the Sonoma County zeitgeist; many of the dishes are gluten-free and/ or vegan. Some items, such as the lentil soup and the tofu tikka (tofu and garbanzo patties) are both. Just east of the Windsor exit on 101, Umé Japanese Bistro manages to conjure the artistry of Japan in a casual familyfriendly hangout. Decorated with a classic simplicity, it’s a place where locals can explore Japanese foods with the guidance of owner Kelly Shu. Born in Taiwan, Shu grew up in her family’s Chinese restaurant in Napa, studied business at U.C. Berkeley, and traveled across Asia for work and pleasure. She even worked in Singapore for five years, and calls the city a “a true melting pot of Asian cultures.” During those travels, she fell in love with the Japanese aesthetic, later studying to be a sushi chef. Her restaurant, which opened 13 years ago, was designed as a neighborhood café and sushi bar. “Customers new to Japanese cuisine can start out with Udon noodle soup and teriyaki grilled meat, and over time progress to our sashimi and sushi,” Shu advises. Along with a variety of sushi and sashimi, the menu includes tempura, grilled fish, and Bento boxes for kids. My favorites are the Wakame salad made of seaweed marinated in sesame oil and any sushi with yellowtail or freshwater eel. Prices vary from $7 to $17 for sushi rolls, $12 and up for lunch, and $15 and up for dinner. What might a more adventurous diner order at Umé? “You’d have an Omakase, which means, ‘Trust your Chef,’” says Shu. For between $50 to $60 a person, you tell the chef how many people and how many courses and the chef will design a custom meal. In that Japanese frame of mind, I remembered another place to eat Asian that’s easily overlooked—the poké bar tucked inside Oliver’s Market prepared foods section, just north of the Town Green. It turns out poké (poh-keh), a rice bowl with raw fish, vegetables and sauce, is actually a Hawaiian invention, but the Japanese workers who migrated to the islands in the late 1800s modified the dish to their taste. For $10, you can pick among many varieties of raw fish, vegetables, and sauces, all stacked on top of brown rice, white rice or asian kale greens. My recommendations lean to the traditional: generous chunks of ahi tuna, avocado slices for richness, edamame for crunch and any other colorful veggies. Sauce-wise, I’ve converted from the typical soy and ginger sauce to the spicy avocado aioli. You can take your poké on the run or eat in the store’s tavern with a nice local craft beer or cider.